Well we've got another critical case, never ending. 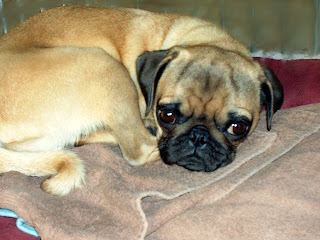 This is Sunny a 9 month old female Pug. Sunny has a liver shunt and if she doesn't have surgery it will kill her. Unfortunately the owners waited too long to turn her over to us and didn't give her the right meds. So right now she is extremely neurological, she can't stand or walk. She is in a zone, like she doesn't see you, this is due to the toxins in the brain that the liver can't clear. In other words her brain is swollen with Poisson. She has so much toxins in her that the ammonia smell is in her breath and coming out of her pores. It is so sad to see her like this. We just got her today. Tomorrow she is set up for a Scintigraphy, to find out if it is an internal or external shunt. If internal nothing we can do about it, if external it is operable. They will inject a dye in her and then take x-rays as it travels. She has started with seizures 3 days ago and has them often. She is very thin as she can't absorb the nutrients. Needless to say she will be expensive and we are max out with Carina and all the other sick ones we have in-house. So once again we are asking for your help. You've all be so kind and generous and as much as we hate to ask you again, we must to be able to save this little one. The Scintigraphy will be about $400 and the liver shunt surgery around $4,500, plus the on-going care. Again thanks so much for your kindness and support. Sunny really needs you! Last night was a difficult night, Sunny got very neurological, couldn't function, couldn't eat. Her jaw was clenched and I couldn't get the meds down her. Her brain just wasn't functioning due to all the toxins. I called the Vet and they told me to give her the Lactulose which slows down the toxins, rectally, which I did. I slept on the floor right next to her as I didn't expect her to make it and didn't want her to go alone. Today we had to cancel her Scintigraphy as she was too critical. They had to put her on IV meds to reduce the swelling in her brain. Problem is she needs to be off the meds for 24 hr. for her test, but without the meds she won't make it. Hard call. We are shooting for the test tomorrow and hope she is stabilized more and can eat on her own an take meds. This is just heartbreaking, if she would have been given these meds when the owner found out about a potential liver shunt she would not be as critical. She is 9 months old and only 8 lbs!! Please keep her in your prayers. Thank you! The last 4 days have been a roller coaster! One minute we thought this is it, we are losing her, the next we think, she is turning the corner. Very difficult. Well we turned the corner. On Thursday she was able to be stable enough to have the Scintigraphy. The results did show an external liver shunt, which is operable. Though there is a small possibility of also an internal one. We need to do an ultrasound next week to check that out. On Friday we went to the specialist. He said she is too weak and not stable enough for surgery yet. He added Phenobarbital to avoid seizures and to stabilize her brain. She needs to be on it for at least 2 weeks before surgery. So now she is on Lactulose 3 times a day, Flagyl twice a day and Pheno twice a day. She eats 4 small meals a day. Good news is she gained almost a pound! The fog seems to be lifting from her brain so she seems more alert and functioning a bit more. Now she has severe moods, she is sweet happy one minute, aggressive the next, crying non stop the next. It is normal due to the toxins in her brain. The meds will clear some of it, not all of it, so we hope it will improve daily. For now it is day to day and see how it goes. Her bills are much higher than expected. But she deserves a shot at life. We thank you all for your prayers and on going support! Sunny is stabilized now, still having some neurological issues, but has gained 3 lbs. and feeling well. She is having Liver Shunt surgery on Oct. 15th. Since she has more neurological problems than most the surgery is a bit more risky. Please keep her in your prayers. Today Sunny had her Liver Shunt surgery. It was a very risky surgery. The Vet said the Shunt was very large, he was very surprised that she was even functioning. The surgery went well, bu the next 48 hrs. are very critical. If the blood pressure goes up too high then we are in trouble. We pray that this little precious baby makes it through okay. Please pray for her. Will send an update in a couple of day. Ms. Sunny is doing well considering she had 3 surgeries in 1! Not only the liver shunt, they also spayed her and while they were fixing her Shunt the Vet found that she has an obstruction in her intestines. He took out some sort of large piece of plastic. She obviously came to us that way as I kept her confined in a play pen before surgery due to her seizures. Good thing they found it now before it got her really sick. So needless to say the surgery was much more expensive, we never catch a break! To my amazement she is recuperating well. Was on pain meds for many days, but she still wants to play, she is supposed to stay still and calm as she has a huge incision with lots a staples. But guess she didn't get that memo. We are hoping the brain will start clearing soon and that she will be able to have a normal life. Will try to post some pix soon! Sunny is doing FABULOUS!! It is amazing what a tremendous there was after the surgery. She is a normal puppy now making up for lost time, as she was in a fog most of her life due to the toxins in her brain. Now that everything has cleared up she is funny, happy, loving and EXTREMELY playful. Gets into a lot of trouble! :-) She is now ready for adoption. Thank you all for your support and prayers. This little one got lucky!